Gambling revenue at Plainridge Park Casino fell by about 1 percent in October, marking the third straight month of declines, as the state’s first casino battles for market share in a region already dominated by larger and more-established out-of-state casinos. The figures continue to cast doubt about whether Plainridge can hit the $200 million in annual revenue projected by the Massachusetts Gaming Commission before its opening. In its first four full months of operation, Plainridge grossed $58.8 million, which projects to about $176 million for a full year. If Plainridge’s revenue does fall short of the projected amount by $24 million, as the current trend suggests, the state would miss out on about $11.5 million in taxes that it projected to receive under its initial estimates. Plainridge’s daily revenue per machine was $277 in October, down from $280 in September, $327 in August, and $389 in July, according to data released on Monday. For October, Plainridge’s gross gambling revenue was almost $12.9 million, compared to $12.6 million in September. But because October has one more day than September, the newly released revenue figures actually reflect a slight decline. Gambling analysts prefer to use average daily revenue per machine as a measure, because it allows them to compare casinos with varying numbers of machines. While a 1 percent downturn may be disappointing, the October figure brought to an abrupt halt double-digit declines that were endured by Plainridge in August and September, when revenue plummeted by 16 percent and 14 percent, respectively. Lance George, the general manager of Plainridge Park Casino, said in a statement released on Monday that “it is normal for revenues to taper down” after a gala opening. “We expect revenues to stabilize and the latest results are in line with our expectations,” the statement continued. Plainridge achieved a stratospheric $580 in daily per-machine revenue in its heady first week of operation. The state takes 49 percent of Plainridge’s gross gambling revenue in taxes. Since Plainridge’s grand opening on June 24, the state has reaped almost $32 million from the gambling facility. Most of that tax revenue, $29 million, goes to aid to towns and cities, but the 2011 casino law also requires that a sizable chuck — $3 million since June — go to support the state’s horse-racing industry. At about $280 per machine, Plainridge’s take is comparable to Twin River Casino’s in Rhode Island, but lower than at the Foxwoods Resort and Mohegan Sun casinos, the two industry giants in Connecticut that pioneered casinos in New England about 20 years ago. Foxwoods and Mohegan Sun beckon gamblers with about 5,000 slot machines each, while Twin River offers about 4,300 machines. 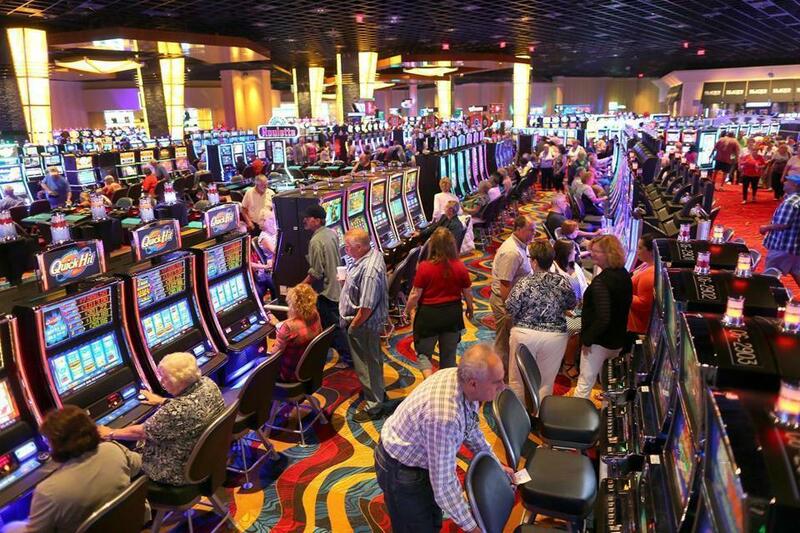 The Massachusetts casino law limits Plainridge to 1,500 slot and video machines. Clyde W. Barrow, a University of Texas professor who has studied the New England casino market, has called Plainridge’s daily, per-machine revenue of $280 high enough for it to compete in the region. Twin River is less than 20 miles from Plainridge, while Foxwoods and Mohegan Sun are less than 70 miles away. But if that $280 per machine figure does not increase, annual revenue will come in quite a bit lower than even the projected $176 million that includes the facility’s stunningly high take in its first week, when thousands flocked to the first casino in Massachusetts. For a 12-month period, $280 per machine at Plainridge would produce $153 million in revenue, or 23 percent less than what the Gaming Commission projected before the facility opened. That would mean a reduction of almost one-quarter in the $98 million in annual taxes contained in the state’s original estimate. Plainridge is expected to take a hit when two much larger casinos licensed in Massachusetts open: Wynn Resorts in Everett and MGM Resorts in Springfield, both in 2018.